Apparently my children love Pop Tarts, something which I’ve only bought once, butsomething they always ask for when we go down the cereal aisle at the grocery store. One day, I really had enough of hearing them ask and the sound of disappointment when I said “No”, and then a light bulb went off in my head, and I said, why don’t we try to make some? Of course, they said, “Yes, can we? How do we do it?” Thus the discovery of how to make Homemade Toaster Tarts (Pop Tarts) came about. And a wonderful discovery it has been. 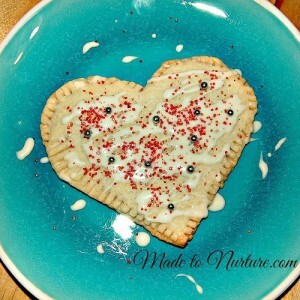 Homemade Pop Tarts/Toaster Tarts taste WAY better than the store bought ones. Now, we, like most families, lead a pretty busy life. I don’t have a whole lot of time to bake with them, so when we can find a quick, easy, yummy thing to make, we’re all over it. All you need for this recipe is pie crust, jam or jelly, icing (optional), and sprinkles (also optional). 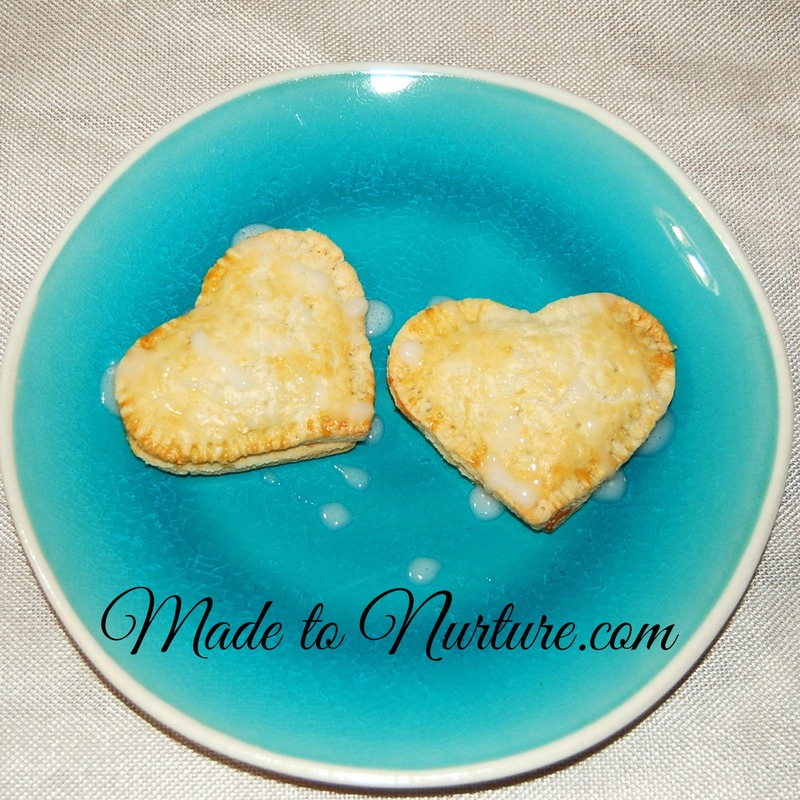 If you don’t have time to make pie crust, you can use pre-made pie crust. The first time we made them we used 9″ pie shells. It was a bit more expensive than I had wanted, but unfortunately the grocery stores where we live only have pre-made pie shells… The second time, I just made my own pie crust, which took a bit more time, but was worth it cost wise and taste wise. I ended up making a double batch of pie crust so that I could freeze some to have the next time we wanted to make them. I say the icing and sprinkles are optional, because my son loved them plain, without the extra sugary topping. He gobbled them up so fast, I had to hide a few so that I could decorate it for photos! Because Valentine’s Day is coming up, we decided to make them into heart shapes, but really you can make them into any old shape you want. An easy to make, alternative to store bought Pop Tarts. **Prep time will depend on whether you are making them with pre-made pie crust or not. Filling filling of your choice. Jam, cinnamon sugar, chocolate, nutella, etc. In a large bowl, mix flour, sugar, and salt thoroughly. Break shortening into chunks and cut butter into small pieces and add to the flour mixture. Chop vigorously with a pastry blender, 2 knives, or you can put the ingredients into a food processor, using 1-2 second pulses, checking the dough frequently. Periodically scrape any clinging fat off the pastry blender, knives, or side of food processor. The consistency should be that of coarse crumbs, with some pea-sized pieces of fat. The mixture should seem dry and powdery. In a separate, small bowl, mix together the egg and milk. Drizzle the egg mixture over the flour/fat mixture. Using a rubber spatula, cut the mixture with the blade side until it looks evenly moistened and starts to form small balls. When you press down on the dough with the flat side of the spatula, the balls should stick together. If they don't, drizzle a bit more milk on top. Dough should look rough. Divide the dough in half, press into a round flat disk and tightly wrap in plastic. Refrigerate for a minimum of 30 minutes or up to 2 days before rolling. If wrapped and stored airtight, it can be frozen for up to 6 months. Make sure the dough isn't too cold. If you have chilled it for longer than 30 minutes, let it stand until it feels firm, but pliable. If you have a marble slab, roll the dough out on this. It helps to retain cold and helps the dough from softening too much. Lightly flour your surface. Place dough onto the floured surface and roll it out from the centre, out in all directions until it is about 1/8" thick. You don't want your dough to stick to your surface, so lightly flour again if it starts to stick. Try not to use too much flour, as your dough will become tough. If the dough becomes too soft while you are rolling it, place it on a cookie sheet and refrigerate until it becomes firm. Cut the shape you desire, all of the same size. Use cookie cutters or if you just want plain rectangles, use a knife. Make egg wash by whisking one egg and 1 tsp milk in a bowl. Brush onto the pastry before putting filling on. Place your filling in the centre of piece of dough, leaving about 1 inch around the edges. Place another piece of dough on top and using a fork, firmly seal the edges all the way around. Prick the top piece of dough a few times with a toothpick. Depending on size, bake for about 15 - 25 minutes or until edges are golden brown. Whisk icing sugar, milk, and vanilla together until it reaches a thick, easy to spread consistency. There are many types of fillings you can put into these yummy toaster tarts. Below is just a few options. Jam filling: Use your favourite fruit jam or jelly. Combine 1 tsp water with 1 tsp of cornstarch and or other thickening agent such as xantam gum. In a saucepan, combine 1/2 cup of your favourite fruit jam or jelly with the thickening mixture. Cook on medium low until it bubbles. Turn off and let cool before putting into your toaster tarts. Cream cheese cinnamon sugar filling: 1/2 cup softened cream cheese, 1/3 cup brown sugar, 1 1/2 tsp cinnamon. Mix using a fork or mixer until well blended. Chocolate fudge filling: 1/3 cup unsweetened cocoa powder, 1/3 cup brown sugar, 3/4 cup milk, 1/4 tsp salt, 6 ounces chocolate (About 1 cup of chocolate chips; dark, milk, or semi-sweet. ), 2 tbsp unsalted butter (cubed), 1 tsp vanilla extract. On medium heat, in a saucepan, combine cocoa powder, sugar, milk, salt. Stir occasionally for about 5 minutes. Remove from heat and stir in chocolate, butter and vanilla. Allow to cool before filling your toaster tarts. Nutella filling. Fill toaster tarts with Nutella. If you want a chocolate icing, add 1 tbsp unsweetened cocoa powder and 1 ounce chocolate to the icing recipe. If you want a chocolate pastry, add 2 1/2 tbsp of unsweetened cocoa powder to the pastry recipe. This is such a fun idea! The heart shape is perfect for Valentine’s Day! My youngest son loves poptarts. I may need to make these for him. They are pretty tasty. I hope he likes them! Thanks for stopping by. This would work for gluten free also! So excited!! Looks so good!